Assassinate a god in this expansion to our 2016 game of the year. What is it? Standalone expansion to 2016's best immersive sim. I'm in a bank vault, up to my waist in water. This is still, technically, a 'ghost' run. No alarms have been sounded. But the hole in the roof above suggests a different story—one of planning, mild carnage, and 'oh, what happens if I do this?' Death of the Outsider's third mission is a standout heist that shows Dishonored's semi-directed design at its best. It's not necessarily my favourite thing about this standalone expansion—we'll get to that—but the dense network of possibilities and routes is as good as anything found in Dishonored 2. Breaking into Karnaca's most secure bank is just another step in protagonist Billie Lurk's plan to kill the Outsider. Lurk, having cast off her assumed identity as the captain of the Dreadful Wale, reunites with her former mentor and frenemy Daud. The aging assassin enlists Billie's help for one last job: bumping off the black-eyed emo god-being at the heart of the Void. As in Dishonored's DLCs, The Knife of Dunwall and Brigmore Witches, Death of the Outsider isn't about Corvo or Emily, (at least beyond the fact that, to Daud's mind, they too were pawns in the Outsider's game). But it is important to the world at large. This is an epilogue. The nature of Billie's task, and the nature of Billie herself, means that Death of the Outsider diverges from the standard template of a Dishonored campaign. To be clear, much here is familiar—it's an expansion after all. But Billie's road to the ultimate assassination doesn't involve a hit list of rich jerks. It can—you're free to kill pretty much everyone you meet, with no Chaos system to punish you for it. But for the most part, your targets are information and items. Billie's powers are different, too, in that they aren't granted through one of the Outsider's offers. Rather, they're drawn directly from the Void. In practical terms, it means they recharge over time, with no need to scour for vials of magical blue juice. Your range of powers are more limited than in previous games, but interesting nonetheless. Displace is the Blink variant, with the notable difference that you can place a marker and then—as long as you have line of sight—choose when to teleport to it. This has a number of uses, not least as an easy method of escape if a fight goes bad. For instance, it combos with Foresight, which lets Billie stop time and scan the nearby area. While looking around with Foresight, you can place a Displace marker, potentially letting you teleport through grates and fences. But these specific instances aside, Displace is most frequently used to move between high ledges and reach other hard to access areas. I'm actually a little underwhelmed by how it feels. It's a small thing, but the extra mouse click required to accurately warp to a place makes supernatural movement feel less snappy and satisfying. Billie's best power is Semblance, which lets you steal the face of an unconscious NPC. It's useful because Billie is a wanted woman, and guards will attack on sight—even out on the street. Walking confidently through a courtyard full of guards is a different kind of empowerment to that offered by Dishonored's typically more direct and murderous abilities. Semblance enables some specific interactions, too, like an auction you can only participate in if you're wearing the face of a civilian. It's not perfect, however—there are so many characters that inevitably some permutations aren't accounted for. At one point, I used Semblance on a shop owner who had a captive locked up in her basement—just to see what would happen. Unfortunately, nothing. The captive reacted as if I was Billie. Crucially, these powers aren't direct attacks (not unless you Displace into an enemy, leading to their gruesomely messy demise). Instead, Billie is more reliant on her tools—including the entertaining new hook mines, which can grab enemies and fling them into walls, floors or even other people. To balance this, there are no runes to collect. Your powers work just as well at the start of the game as at the end. Instead, your money is spent on new bone charms and gear upgrades, both of which enable some powerful playstyles. In a longer game, the reduced toolset might feel stale. But, across the ten hours Death of the Outsider took me to complete, I never felt short of options. These new powers, tools and small tweaks sit well in environments that are more directly comparable to Dishonored 2. Once again, you'll be exploring densely packed areas, full of detail, side stories, and money to pilfer. New for Death of the Outsider is a contracts system, which lets you pick up optional objectives from the black market. Some will take you to areas off the critical path. Others will challenge you to play in a specific way—make it through an area without alerting a soul, or murder all but one specific person. It's a fun extra that makes the most of Arkane's level design. Some will no doubt balk at how two of this expansion's five missions take place in the same district. Personally, though, I welcomed the opportunity to return to the scene of the crime. Upper Cyria, the area in question, feels large and full of things to do on your first visit. While my return was far shorter having learned the layout, it was gratifying to see, for instance, how the black market responded to my earlier break in. Also, the second visit ends in that bank heist, so it's hard to feel hard done by. A theme running throughout Death of the Outsider is of return and reevaluation. My favourite thing wasn't a mission or an individual section but the chance to see the world react to the events of Dishonored 2, and from a new perspective. It frequently shines new light on characters from throughout the series. Billie, obviously, and the Outsider, of course. But also the groups that you, as various protagonists, have previously encountered. The first few missions offer hints that the witches—powerful, late game enemies in Dishonored 2—are now desperate and vulnerable, scrabbling to regain a scrap of the power they once held. Later on, Billie visits the Royal Conservatory. Once a witch stronghold, it's now held by the Abbey of the Everyman. The Abbey has always been antagonistic to each Dishonored character's Outsider-blessed adventures, but here, in the basement where the remaining witches are held captive, their malice is brought into focus. The combination of their wanton cruelty, Billie's personal connection to the witches, and Death of the Outisder's relaxation of the Chaos system culminated in bloodshed, as I abandoned a non-lethal approach that had persisted over two games. It was a convergence of story and systems to create a meaningful and justifiable switch in the way I was playing. Death of the Outsider's story works best when it's toying with the morality of its factions and characters, and offering a different context for their actions. That strikes at the heart of the central objective: killing the Outsider. Daud's obsession with his death comes from a place of righteousness—of railing against his acceptance of what he now views as a Faustian pact. But Death of the Outsider also challenges that assumption. There are no heroes here, and everyone's reasons—even if they're ostensibly selfless—are put under a spotlight. Even the rats are recontextualised. Once the source of Dishonored's plague, now they appear as a cryptic ally who Billie can consult for advice and, more frequently, musings about biting and chewing. Nonetheless, there's a lot to pack in. 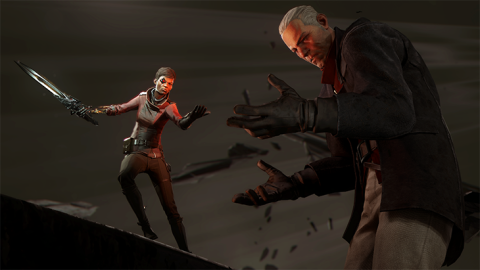 By focusing on Daud and Billie's personal goals, the ultimate truth of the Eyeless—the cult that Billie goes up against in her search for the Outsider—feels rushed. The final revelations are crammed into the confines of the final mission. There's a lot to unpack here, and it results in a dense delivery of cryptic clues that feel better suited for multiple missions—especially when key lines of dialogue are in danger of being missed, or wiped out by an errant sticky grenade. While I'm griping, that final mission also introduces a new enemy type—an irritatingly tough new foe that doesn't follow the general rules of killing a Dishonored enemy, while also being more mobile and more numerous than the Clockwork Soldiers. Such small grievances add up, and do take some of the shine off an otherwise accomplished slice of freeform stealth action. When Death of the Outsider is at its best, though, it's a worthy accompaniment to the series at large. It's full of enjoyable new encounters and scenarios, offers new perspectives on characters and events, and, through its audacious central goal, caps off the existing Dishonored storyline in style.